Packaged FINDINGS: Jell-O Has It In the Bag (so to speak)! If you haven’t noticed yet, flexible packaging is taking over retail shelf space at an accelerating rate. From the brand side, there are many good reasons for this happening – flexible packaging can enhance your brand image as well as consumer satisfaction while safely and cost effectively putting your product on shelf. Flexible packaging provides consumer benefits by potentially offering enhanced use and resealability (and some might argue improved taste), and there are definite examples of flexible packaging better aligning with consumer tastes and lifestyles – as in the adaptation of baby and infant food packaging. Recently, as I was navigating my local mega mart I came across a display at the end of an aisle featuring Jell-O products. It was immediately clear to me that the display contained a new packaging structure and graphic design, converting from the traditional “bag-in-carton” to a footed pouch – with new package graphics accompanying the structural change. The display header echoed the new graphic design, which was clean, bright and colorful – unmistakably a contemporary, novel approach for Jell-O. The package graphic design retained the strong Jell-O brand from earlier packaging, supported by large, iconized designs of fruit, which informed and reinforced the flavor choice making it easy for consumers to select their desired flavor. Creative typography reinforced flavor messaging, pairing typestyles with fruit characteristics. The addition of “simply good” above the flavor copy was reinforced with prominent communication on natural flavor content immediately below it. The selective use of a spot varnish behind the brand and flavor elements highlighted and brightened the brand and flavor copy, helping the face panel to stand out and quickly capture consumer attention. I did find it a little confusing when I noticed the flavor icons changed to things other than fruit, with several packages containing images and copy for vanilla bean and what was supposed to be a block of chocolate. But I soon discovered these were packages for pudding mix as opposed to gelatin mix – and there it was, nestled in the lower left corner, discreet copy noting the distinction between gelatin or instant pudding mix. What took me some time to discover was that the pudding packages featured a spoonful of pudding, whereas the gelatin packages contained a block of gelatin, which didn’t seem to send a strong cue. 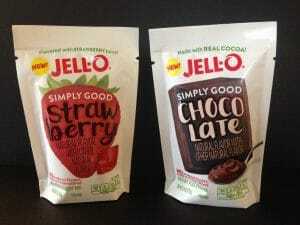 Jell-O products have been a fun family food for generations, and to me, the new package is very effective in making the leap to the flexible packaging side. Everything about it is simple and fresh, including the back panel, which for its size packs a powerful amount of information that remains legible – something that as a consumer I appreciate a great deal. More importantly, I appreciate that I have one less package to open when using a Jell-O product. Good for the environment and easy for the consumer. Plus the footed pouch format is stable enough to stand up and stand out on shelf – one of the key functions of packaging. This clearly shows that the packaging team took the appropriate time to use the correct stock and construction to put a package on shelf that still has a primary display panel and reaches the consumer within the 5 in 5 rule (noticed in 5 seconds from 5 feet away). 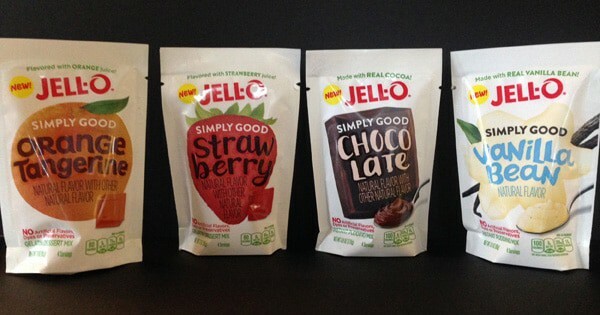 Jell-O did a great job of making a positive first impression, as consumers saw them “flexible” for the first time. If you are thinking of transitioning to flexible packaging, contact us at 920-725-4848 or info@brand-directions.com. Throughout our 60 plus years in supporting customers with consumer brands large and small, we apply our experience and expertise to the entire process to create efficient and effective solutions. Our team of experienced professionals knows the best tools, and most effective visuals and messaging to make your brand not only stand out but win in the marketplace.